Journalist and author Alexis Okeowo recently released her debut book, A Moonless, Starless Sky: Ordinary Women and Men Fighting Extremism in Africa, the product of five years of living and reporting within Africa. Okeowo’s work focuses on four narratives that intricately come together to create a powerful image of modern Africa. Her thorough reporting gives readers glimpses into the lives of a Uganda couple kidnapped by Joseph Kony’s LRA and a Nigerian girl evading Boko Haram, among several others. Okeowo’s work focuses on the lives of ordinary people performing incredible feats in challenging circumstances, bringing their often under-recognized stories into the public eye. Okeowo was raised in Montgomery, Alabama and graduated from Princeton University. She is currently a Brooklyn-based staff writer for the New Yorker and was a member of the 2016 & 2017 classes of New America National Fellows, and was a 2012 IRP Fellow reporting from Nigeria. Her work has also appeared in the New York Times Magazine, the Best American Travel Writing, and the Financial Times. 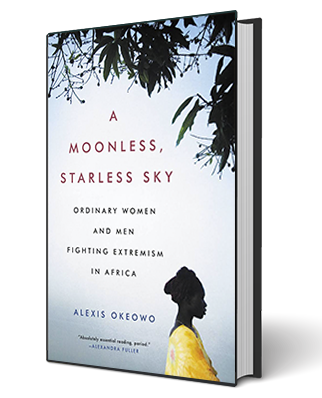 Copies Of Alexis Okeowo's A Moonless, Starless Sky: Ordinary Women and Men Fighting Extremism in Africa will be available for purchase.